The maxi dress has become a summer style staple here in the UK, with different fabrics and prints to suit all tastes. Here are a few of my favourite picks; BHS actually do a pretty good range too! 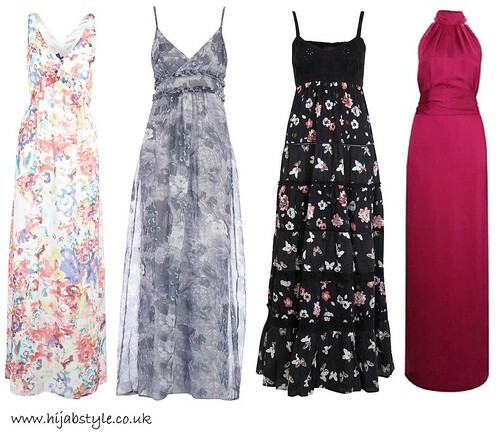 Watery floral maxi dress £75, Warehouse; Grey boho maxi dress £35, Dorothy Perkins; Mixed print maxi dress £45, Miss Selfridge; Acapella drape maxi dress £185, French Connection. waaaaaaaaaaaaat too expensive sis! some people on budgets lol! i go on ebay! or primark. I've just bought two maxi dresses for myself (a plain denim look fabric and a printed one, both from HM) and another for my daughter (from New Yorker). With the wide range of colours, patterns and fabrics around, they're great for expressing yourself in different ways! I live in Sweden and I can´t find long dress...but the black was very beautiful!